Working Miniature Kitchens | Tourmaline . **This post was last updated 11/21/16. Lately I’ve been getting a lot of views on my My Mini Monday post – “Tiny Kitchens for Cooking Real Food.” As much about that post is outdated, I’ve decided to share again on this topic. Hope you enjoy this Wednesday special of MMM! If you’re on Facebook, Youtube, the internet in general you’ve probably seen some tiny kitchens. If you haven’t – check out these playlists. There’s now even a mini cooking cafe! After seeing these videos, some of you may begin to wonder how you can start your own tiny kitchen. Well, first thing’s first, you’ll need a tiny oven. Each of the below are heated with a tea light candle. The oven you see repeated in quite a few videos is an incense burner that can sometimes be found here: https://huss-weihrichkarzle.de/en/mehrzweckherd.html. This stove comes complete with what’s pictured below – 5 kitchen accessories and 3 pots. A miniature cast iron oven is also an option. 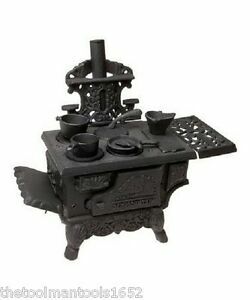 These are vintage replicas of real stoves and are best found on ebay, such as this listing for $36.48, http://www.ebay.com/itm/Old-Mountain-Cast-Iron-Cooking-Oven-Set-Miniature-Wood-Burning-Stove-Pots-Pans-/281545839803. Check each individual listing for what accessories come with the stove. Most do seem to come with a variety of pots and pans. If you want a specific look or scale, it’s best to either make your own or contact a miniature maker. When first researching this topic, I successfully made on from aluminum and polymer clay. If you’d like one like this email me at jennifernicholewells@outlook.com. If you’d like to try your hand at making your own, these tutorials may help. As with any cooking, in any scale, you need to use supplies that are safe to cook with. 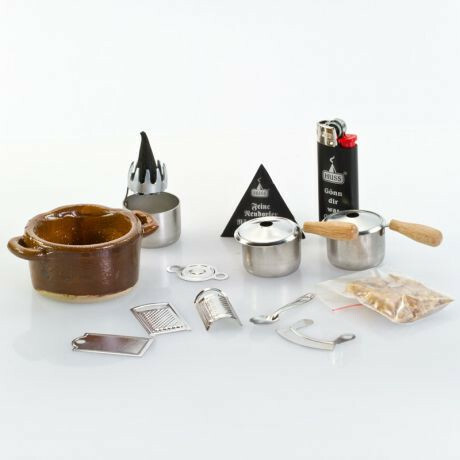 Dollhouse miniature kitchen supplies you buy from the miniature sections of shops have a coating that will bubble and release fumes if exposed to heat. Be sure to use cookware that is uncoated metal, safe to use ceramic cookware, or uncoated cast iron. The supplies that come with the first 2 sets listed above are made to be exposed to heat and therefor safe to use. I’ve made my own by cutting aluminum baking sheets and repurposing metal bottle caps. Be aware that metal caps have a plastic lining that you will have to remove before cooking in them. Also, since these stoves are heated by tealight, the flame needs to be very close to your cooking surface. If things aren’t heating up, see if there’s a way to get your item closer to the heat source. Be patient and experiment. You’ll learn the best way to use your mini stove in no time. Questions? Let me know below. I made a mini stove by taking a sweetened condensed milk can. First, I peeled the paper off the whole can. Then, I cut off the top of the can for a clean hole, using a can opener. Next, I ate all of the sweetened condensed milk. Finally, I used a sharp tool to poke a bunch of holes in it for ventilation of the candle. All you do now, is put a lit candle on a table and put the can on to of it. Buy or make your own pots ‘n pans, and cook! That’s wonderful! And how innovative. I made a working miniature kitchen for my daughter’s AG dolls by using an old cookie tin, about 9″ x 5″, oblong rectangle shaped, stuck atop a wrought iron cat food dish holder that was the same basic size as the bottom of the tin. Oven door was snipped out of center in front, about 5-6″ across, cut down either side and leaving bottom attached. Cookie tin lid holds the flap shut, and is replaced after fuel is inserted and lit…it’s still requiring a bit of finessing and could use a silicone lip/gasket and some hinges on it, maybe. Vent holes poked in rear for chimney made of pineapple juice cans snipped and rolled up a bit tighter, then fit together to pipe away smoke. I painted the tin with high-temp black spray paint, the stuff you can use for grills and engines, bought from Lowe’s, and did “burner eyes” in silver. I noted that it did give off a bit of a smell the first time it was exposed to heat, however. After that, just fine. I lined bottom of “oven” with foil, for easy cleaning, and use esbit tablets, the homemade variety of wax-soaked cotton balls, or a tea light for fuel. I have another pet dish holder that is a “camping stove”, with mesh over the openings for the bowls, and a tray beneath to hold fuel pellets. Works great, actually, and could be used by an adult for a camp stove in a pinch. A “pet tent” is the perfect size for the dolls, via ebay, and the soft-sided dog playpens make a bigger deluxe tent as well. A loose-knit scarf, fringe optional, makes an excellent “hammock” with mini caribiners on either end, and a small camera bag makes the perfect “back pack”. For a sink, I used a ceramic trough-shaped dish, and made a backsplash of tiny tile glued on to two boards stapled perpendicular to each other at 90 degrees, like an L shape, and stuck this atop another rectangular tin. Inside the tin is an IV-style bag or hydration bladder, with the tube run out to the piece of bic pen painted silver and large wingnuts that make up the faucet hardware. Bag is squeezed to make water flow, but no drain has been put in just yet, altho manual emptying works fine. A hole for reaching in to the tin was cut out, too, and the edges dulled for safety. I used the same technology for the bathtub/shower, which is a claw-footed brass planter, with the bag hidden in a small box cupboard, and a needlepoint hoop with fabric clamped inside for a shower curtain. For fridge, I used an old jewelry box, the kind with a glass-fronted door, and painted it to look like an old icebox. Doesn’t work, per se, altho I suppose that it could if I stuck a freezer gel pack in the top compartment. A few panels from a soft-sided cooler bag or just styrofoam would make good icebox insulation, and then an old wine crate or something for the sides, maybe? I had lots of fun making these things, took a bit of trial and error, but you’ll find that lots of stuff can be made of household items, particularly once they’re painted. Wow, sounds like a lot of work but well worth it. I’m sure it all looks amazing too. Thanks for sharing your experience with us. Adorable right? It’s easy to see how mini cooking has become so popular. Making food is definitely a bit tricky. I haven’t done a lot of cooking with it, just the little pizza, scrambled eggs and boiled water you see in the gallery of images. But those people in the tutorials at the top have for sure mastered it. I agree! This is awesome. Those videos are mesmerizing! You need steady hands to engage in miniature cooking.